Design ROI - is your business looking good? Home » Blog » Design ROI: Is your business looking good? One person’s work of art is another person’s pile of rubbish. Design though, is not just about art – not just about layout or choice of colour. Whether your business is centred around a website or you sell furniture or electronic gadgets, there is a requirement for good design in every area of your business. 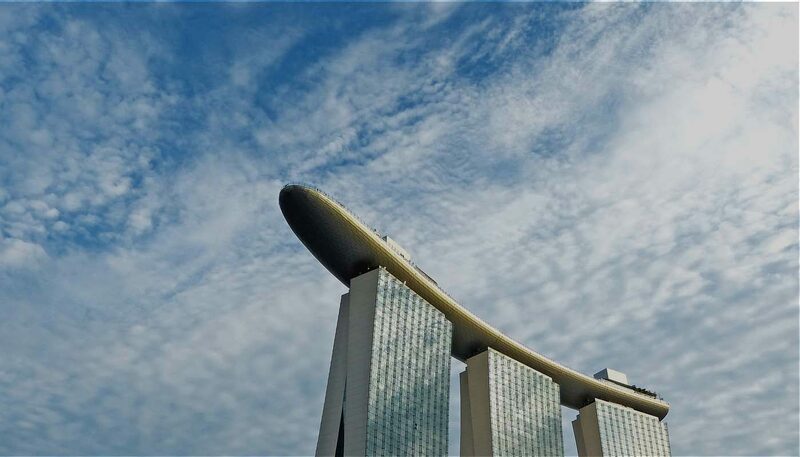 This article looks at those areas and makes a bottom line case for the importance of design. “You can’t judge a book by its cover”, they say – whoever they are. This phrase is often used to explain that the way something looks is not an indication of its value. For example, beautiful people may be horrible, a smart-looking book may be boring, and a new smartphone may perform badly. The fact is, people do judge books, phones, people and gadgets on the way they look. The design of the object or the presentation, is what makes them want to examine it further. Would we pick up a newspaper if the front page was filled with small text instead of a large, eye-catching headline? Would Apple be as successful were it not for the reputation it has grown for superb design? Designers often talk about making things intuitive – one way to do this is to be obvious and stick to familiarity. In the late ’90s and early part of the 21st century, web designers were experimenting with unique, obscure web designs. A website was considered cool if it had some kind of metaphorical navigation, or some mystery to it. You had to work out where things were or how to find things; like it was some sort of game. In reality, the only people who really liked this kind of approach were the designers trying to impress each other with their graphic design skills. Website users can’t use a website if there is no obvious way of finding information; if there is no familiarity to structure. 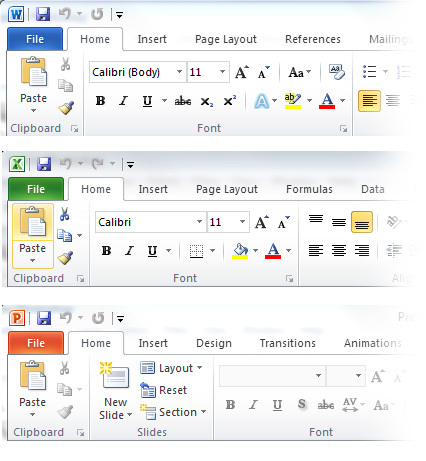 Microsoft Office applies the same design principle across Word, Excel and Powerpoint, so that users are familiar with functionality between the products. The iPhone operating system uses clear icons to help users start using the phone without any need for instructions. 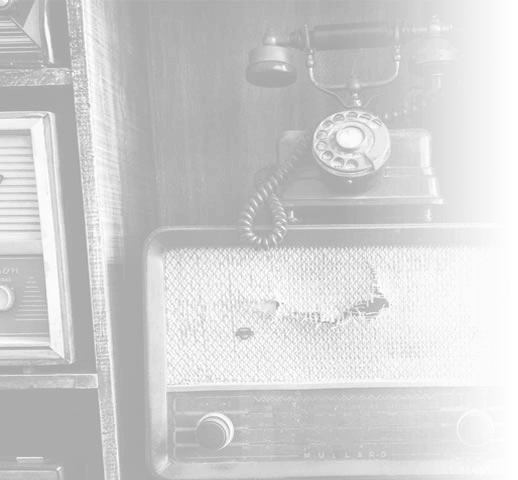 At the bottom of the screen, four key functions are clearly signified – phone, email, web, music. In everyday use, good design is largely unnoticeable. Well-designed websites, advertisements, products, maps etc. should all be intuitive and easy to use – it is design that makes this happen. 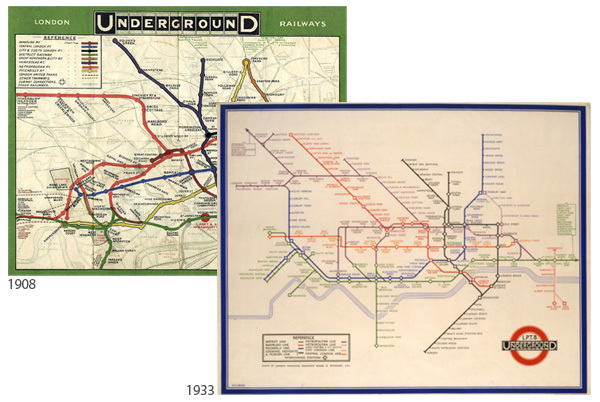 One of the most famous examples of well-designed maps is the London Underground map. In 1908, the London Underground map followed the topology of the rail network. In 1933, Harry Beck invented the more structured design that is still in use today. Great products look good but are also easy to use. Apple has pioneered the drive for simplicity in computing. From the unwrapping experience of any Apple product to the switching on moment, Apple products are easy to use. Remember when computers came with a quick start guide and a full user manual? Nowadays we just plug in and play, and the manual is found through scouring the Internet, where other customers are ready to help us find the answers. Plugging in peripheral devices to computers used to be a complicated process that often required custom drivers, installing software or following other instructions. These days, the developers of the USB standard have made it possible not only to plug in a separate drive, a mouse or a keyboard, but you can also plug in a smartphone to charge it or use it as a storage device. 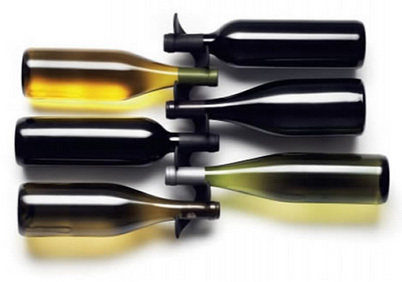 When considering the marriage between design and functionality, how about a wine rack that also creates an artistic display on your wall? This design is by Jakob Wagner. 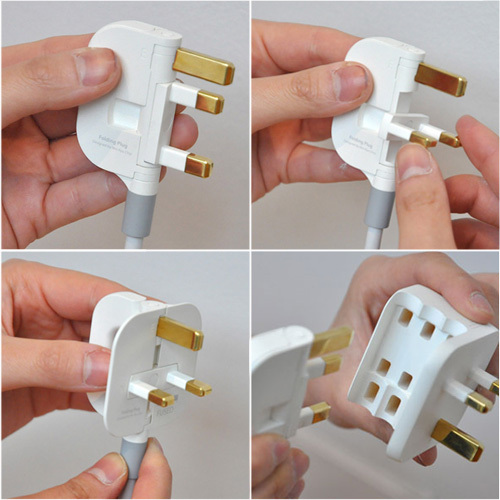 Look at the amazing and versatile Folding Plug, created by Min-Kyu Choi – a graduate of the Royal College of Art. Whether you are designing a phone app, a website, an infographic or an automated teller machine (ATM), usability is important. There is a skill required to predict user requirements, organise options in a logical way, and to plan a user journey. When it comes to websites, we talk about instant gratification. If a visitor doesn’t see it load swiftly or can’t see what they are looking for quickly, they may leave. A website should be clear within a couple of seconds – the brain should be able to understand what it is looking at, or, again, the visitor may decide they can’t be bothered. See also: What happens when I click this button? What we have learned about design on the web and on mobile phones has helped us to improve user experience in the real world. 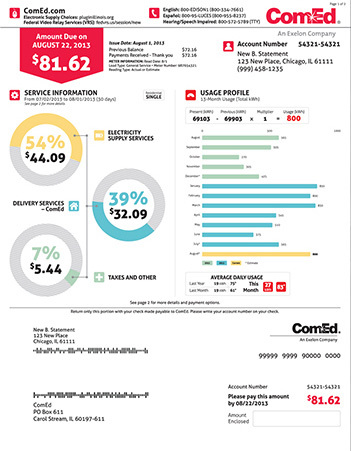 Energy company ComEd re-designed its consumer bills to make them more visual and easier to digest. Nationwide Building Society has recently done something similar; giving its statements a make-over, adding colour and a better structure so that the information is easier to read. Other utility companies are following suit – carrying brand identity and usability across from web to paper and vice versa. When you buy tickets at a train station using an automated machine, the process needs to be simple enough to use without you wasting time reading instructions. Driving a new car relies on tried and tested iconography to help you find indicators, air conditioning, lights etc. easily, without having to learn from scratch what everything does. Design essentially, is more than how things look. It is also about how they are used. The better the usability, the more enjoyable the product, which means more people are likely to want to use it. In his book ‘Insanely Simple: The Obsession That Drives Apple’s Success’, Ken Segall, former creative director of Apple, tells the story of how Steve Jobs would wield “the simple stick”. In one case, the design team had created packaging for two versions of the same product. Jobs thought the idea was silly and told them to make one box and one version of the product. His philosophy was to take everything to its simplest form. Giving customers one option avoids what is known as the paradox of choice. The less choices there are on a restaurant menu, the easier it is to decide what we want to eat. On a website, smaller navigation menus can make it easier to find things. Give users too many sections and sub sections and they may not know where to look for what they want to find. The “less is more” philosophy is an important feature of good design. Just like the iPhone screen, with four buttons for core device features, simplifying your design helps customers get things done. Bamboozle them with choice and you risk them doing nothing. This approach is important when designing landing pages, where you want visitors to take action. Good landing page design should avoid distraction, focus on clarity, and be obvious. As I stated at the beginning of this article, people do judge a book by its cover. Packaging is as important as a logo, a reputation, or the design of the product itself. Whether it’s an eye-catching carrier bag for a sports shop, a wine bottle with two glasses combo or some stylish fruit juices shaped like an orange, packaging design can be the difference between infamy and obscurity. The same goes for websites, apps, advertisements, games etc. The graphics, the interface, the way it works or even the noises it makes – all contribute to the user experience. Design ROI – how do you value good design? In order to measure return on investment (ROI) you need to know what return matters to you. Design is not something you spend money on in return for direct measurable income. A lot of the benefits are anecdotal or assumed, so how do you know you are getting a return on your investment? Basically, you get what you pay for. You can get a website built for a few hundred pounds, and you can get a logo for less. However, will your low budget operation be compatible with mobile browsers, integrate well with social networks, and convert users? Does your low budget web designer know about coding, or conversion optimisation, or writing copy to assist sales? Can a low price cover all the bases that are needed to perform an impressive job?